We sell Tiny Homes in Kingsland, Texas one hour West of Austin. Our customers love the Granite Lake showroom and our affordable prices on Platinum Cottages. Call Lisa (512) 844-1104 to set up an appointment to tour the tiny homes. Ask about test-driving one of our fully furnished rental units to try tiny living before you buy. 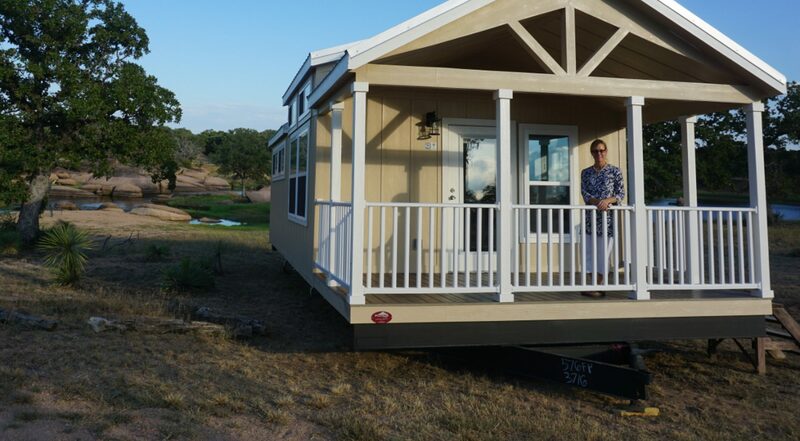 Lisa Morgan is excited to offer Highland Lakes Tiny Homes as an authorized retail outlet for Platinum Cottages. We serve Central Texas and the Hill Country including Marble Falls, Llano, Burnet and Fredericksburg. Customers from beyond Central Texas also buy from us because of our low prices on Platinum Cottages.-We maintain a small inventory of homes ready for immediate purchase on site. You can also custom order a tiny home. Lisa can guide you through color alternatives and upgrade options in order to design a home which closely matches your style and meets your individual needs. It all started here at Granite Lake when we set up three furnished tiny homes in 2017. We live full-time in one home and set up the other two for friends, family and rental guests. Everyone that viewed the homes were so impressed with the quality of Platinum Cottages that we became a dealer! We typically have tiny homes for sale in our inventory ranging from $45,000 to $56,000 here at Granite Lake. These homes are ready to be relocated to your land or a lot-lease community. Customers can also special order a Platinum Cottage. Base prices start at only $42,000. We have samples of all of the color and material options to help you select and order just what you want. While exploring Kingsland, TX in 2015, we stumbled upon this unique little lake and a “For-Sale-By-Owner” sign. Much to our surprise, the price of the land was cheaper than a small home in Austin. Timing is everything and we knew this was our time! We have been enjoying our “399 square feet of luxury” next to Granite Lake since June 2017. The efficiency and freedom afforded by living tiny inspired us to share the lifestyle and the land with you! Come out to visit us! Living in a Platinum Cottage tiny home inspired me to become an authorized retail outlet for the manufacturer. We are located one hour west of Austin in the heart of Texas Hill Country on a small private lake in Kingsland. We love the lifestyle that tiny affords! Come out to visit Granite Lake to tour the tiny homes and enjoy the property – whether you are looking to buy or not. Check out our Tiny Home Blog!